Reviewing restaurants in the seven cities and beyond. 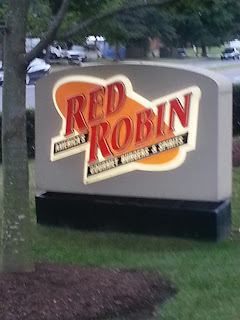 I’ve visited Red Robin Gourmet Burgers countless numbers of times but this is my first review. Why? I have no idea. Today probably wasn’t the best time to visit because I’m dieting. However, my daughter is leaving in two days to go back to school and this is where she wanted to go. So, I pushed the diet aside and agreed to oblige her. Many people may think that it could be difficult to find healthy options at a burger joint. And those people are probably right but I counted this as a treat meal and promised myself that I would get back on my plan first thing Monday. No, seriously. I started out the meal with the hummus plate (355 calories, 23g fat). It came with baby carrots, cucumbers and chips. Chips? Why chips? 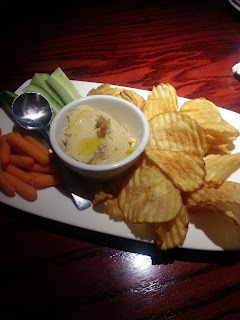 The veggies were crispy and delicious and the hummus was smooth and creamy. 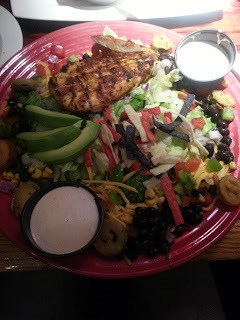 For my entrée I ordered the southwest grilled chicken salad with the dressing on the side. I love this salad because of the avocado, black beans and fried jalapenos. Even though it’s a salad, it’s a pretty big one and without the dressing comes in at 711 calories and 35g fat. In a salad. That’s more fat grams than I normally consume in an entire day. I’m not knocking the salad – I loved it and left nothing on the plate – except the dressing. The kids, who are not dieting indulged in the gourmet burgers. Why else would you go to a burger joint if you weren’t getting burgers? My son ordered the banzai burger (973 calories, 55g fat). 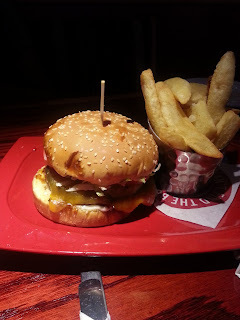 The burger is marinated in teriyaki & topped with grilled pineapple, cheddar cheese, crisp lettuce, tomatoes and mayo. It looked great and he loved it. My daughter, who is not that adventurous ordered her usual bacon cheeseburger without mayo (782 calories, 42g fat). Both burgers came with steak fries and they both ordered the freckled strawberry lemonade. 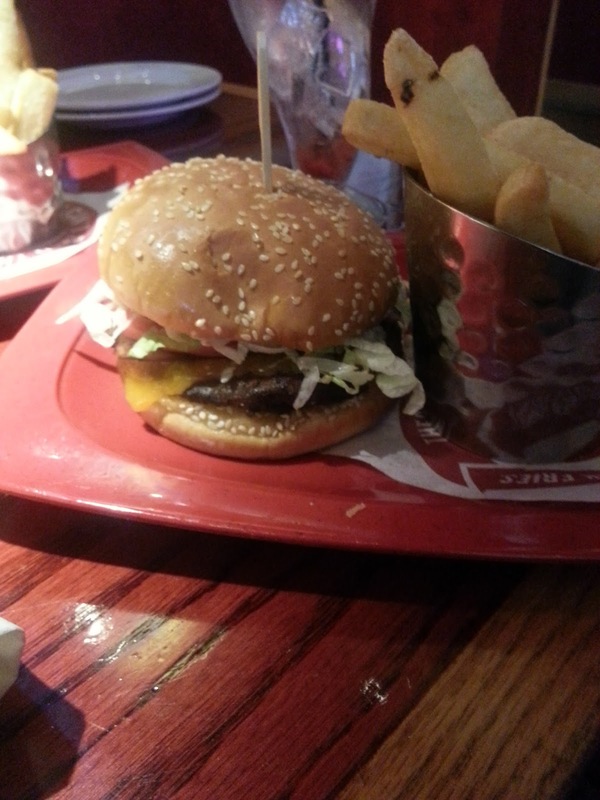 I like Red Robin. There are no surprises. We were seated immediately and the server (Elizabeth) was great. It was early on a Sunday evening and there was a pretty good crowd but that didn’t hinder our service at all. 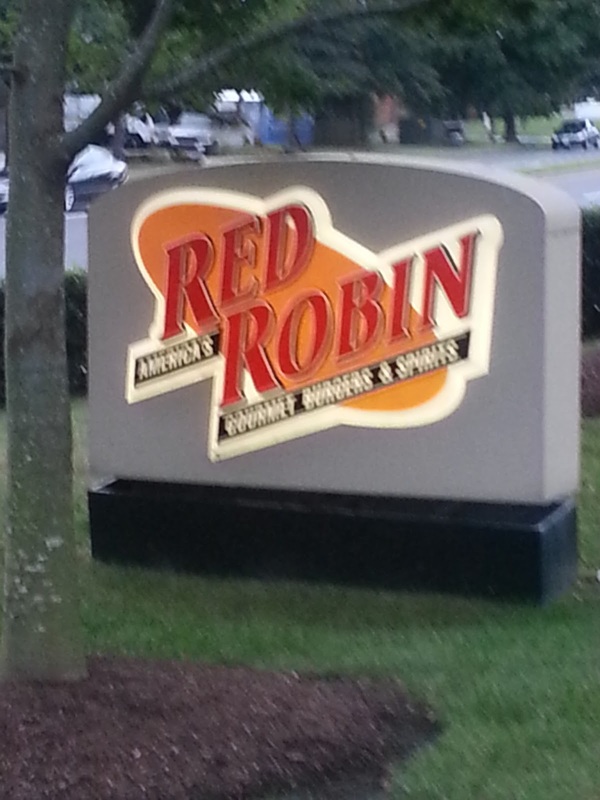 When I go to Red Robin, this is the one that I turn to. *Note: I am not compensated in any way for the reviews contained on this blog. I review restaurants because I love to eat and I love to write. Create Your Grocery List with DinnerTool!